Ready for some fun, candy corn-themed crafts for the kiddos? Here we go! 1. 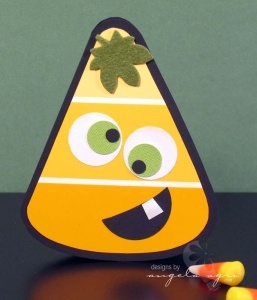 The Candy Corn Bandit! 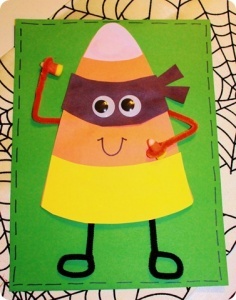 While the link above will lead you to a scavenger hunt-like lesson (courtesy of The Inspired Apple), the photo alone should be enough to get little fingers a-cuttin’ and makin’ their own Candy Corn Bandits to add to your Halloween decor! All this one needs is paper plates, paint, a paint brush, scissors, and some ribbon or twine. Easy peasy, and lots of fun for the little ones. Paint chips? Yes, paint chips! Those perfect little color sample cards found at almost every large home improvement store. 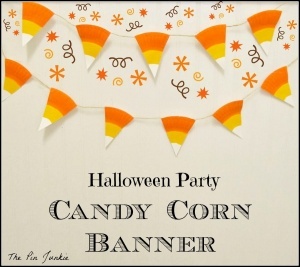 Gather up white, orange, and yellow paint chips and call it a party! Isn’t he (or she) adorable?! 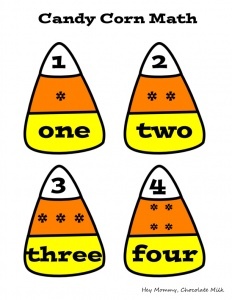 Also called Candy Corn Math over at Hey Mommy, Chocolate Milk, these candy corn printables are not only a fun craft but an easy way to up your kiddos’ math game. Who knew candy could be so educational? This one’s a super simple craft for little fingers exercising their fine motor skills and their cutting skills. 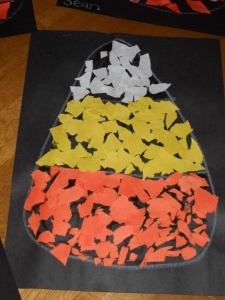 Scissors, glue, and construction paper … does childhood get anymore fun than that?